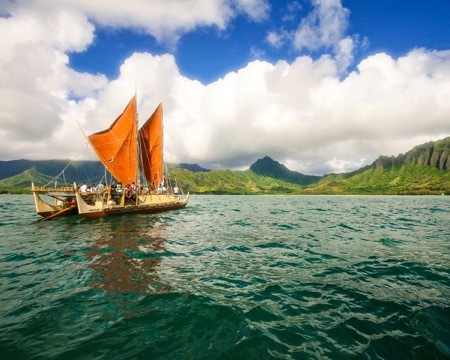 As part of its three-year circumnavigation of the globe, the Hawaiian voyaging canoe Hōkūleʻa arrived in Tahiti this summer on the first leg of its worldwide voyage. When the Hōkūleʻa visits, Tahitians say, Maeva, a hoi mai, meaning “Welcome home.” There is a well-documented tradition of voyaging between the two island groups, and it is clear that in the 13th century, Tahitians used sophisticated navigational skills to travel the 2,500-mile distance and settle the Hawaiian Islands. 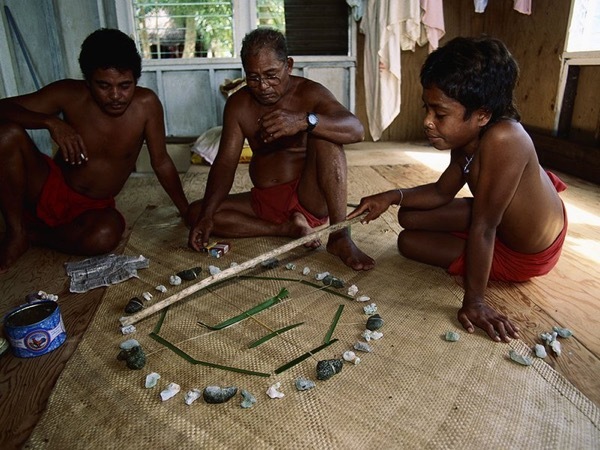 Archaeological and linguistic evidence shows that navigators from Tahiti’s neighbor islands the Marquesas had settled the islands even earlier. Skepticism over the validity of those navigational methods has long muddied the waters. A most notable naysayer was ethnologist Thor Heyerdahl whose 1947 Kon Tiki raft expedition advanced the drift idea that colonization occurred only as vessels simply traveled on the tides. But the 1976 voyage of the Hōkūleʻa—guided by Micronesian navigator Pius “Mau” Piailug—resolved the debate. Piailug demonstrated his profound skill for reading the night sky and the ocean swells and safely guided the massive ocean-going canoe from Hawaii to Tahiti. Navigation is as much an art—and a spiritual practice—as it is a science. It requires enormous knowledge of the night sky and how it changes both with latitude and throughout the year. With that knowledge, the rising and setting of stars form a compass, a clock, and a means to calibrate latitude. The story of how these skills have been lost, and then rediscovered, and practiced once again, has been made fraught by European notions of racial superiority. My guess is that many more know of the Kon Tiki—documented in an Academy-Award-winning film, than of the far more significant Hōkūleʻa that Piailug piloted. Here’s why it should be the other way around. Captain James Cook had spent a lot of time in the South Pacific before he crossed the equator and came across the hitherto unknown Hawaiian Islands in 1778. Cook had brought with him Tupaia, a high priest from Tahiti and Ra‘iatea 2,500 miles to the South. Surprisingly, Tupaia was able to converse with these new islanders in their mutually intelligible languages. Amazed, Cook posed the now-famous question, “How shall we account for this Nation spreading it self so far over this Vast ocean?” With that, Cook created “The Polynesian”: the people of “many islands” who inhabit the Pacific from Easter Island in the East to New Zealand (Aotearoa) in the Southwest, to Hawaii in the North. These three points define what is called the “Polynesian Triangle.” Geographically, it is the largest nation on Earth, more than 1,000 islands spread over some 16 million square miles of ocean—larger than Russia, Canada and the United States combined. The linguistic connection proved beyond a doubt that the peoples of this region were all connected. Cook’s question, however, haunted scholars for the next 200 years. Westerners were hard-pressed to explain how “stone-age” peoples with “no math” or writing could cross thousands of miles of ocean in open boats—long before Columbus even thought of sailing the ocean blue—and probably against the wind and currents, to locate tiny dots of land in a vast ocean. The initial and obvious correct conclusion was that the Polynesians had once been great navigators, but that posed a problem for the European colonizers of the 19th century, who saw themselves as superior. This was a handy argument for British colonists in New Zealand, living side-by-side with the subjugated Maori (Polynesian) population. Enter the Maori scholar Te Rangi Hiroa, known better for his anglicised name Sir Peter Buck. Buck set about tracing oral traditions of voyaging throughout the Pacific, and presented his evidence in his 1938 work entitled Vikings of the Sunrise. He documented a step-by-step migration eastward from Southeast Asia, a theory that came very close to the truth. But skeptics remained, the most famous—but by no means the only—was Thor Heyerdahl. Not only did he reject the voyaging tradition, but he rejected the West-to-East migration as well. Heyerdahl argued that the Pacific had been settled by accidental drift voyaging from the Americas. His argument was based largely on the wind and current patterns in the Pacific, which flow predominantly from East to West. Where the oral tradition posed Polynesians voyaging against the wind, Heyerdahl argued it was far more likely that American Indians drifted with the wind. He made his bias particularly clear by designing his Kon Tiki raft to be unsteerable. There is no doubt that the voyage of the Kon Tiki was a great adventure: three months on the open sea on a raft, drifting at the mercy of the winds and currents. That they did eventually reach Polynesia proved that such drift voyaging was possible. But all other evidence pointed to Southeast Asian origins: oral tradition, archaeological data, linguistic structures and the trail of human-introduced plants. Today we have strong evidence that Polynesians actually reached the Americas, not vice-versa. Nonetheless, Heyerdahl remains famous. His notion of “drift voyaging” was taken up by Andrew Sharp, whose 1963 book discredited step-by-step the possible means by which Pacific Islanders might have navigated and fixed their position at sea. But a decade later, in 1973, a team of computer modelers showed that the settlement of the island Pacific by drift voyaging was “extremely unlikely,” and that Hawaii, New Zealand and Easter Island could not have been settled by a drift process. One way or another, there had to have been intentional navigation. About the same time, British sailor David Lewis went out to remote Pacific islands to find and study with traditional navigators. His book We, the Navigators: the Ancient Art of Landfinding in the Pacific laid out for the first time the actual methods of traditional navigation. Lewis became a member of the Polynesian Voyaging Society and was aboard the Hōkūleʻa for its 1976 voyage to Tahiti. It was on the 1976 voyage that a traditional navigator was engaged for the first time. By successfully navigating the 2,500 miles to Tahiti and making landfall, Mau Piailug demonstrated the efficacy of the various techniques of navigation and landfinding. He showed that the rising and setting of the sun can be used to set direction by day. For a navigator with detailed knowledge about the rising and setting of many stars, the night sky provides direction and latitude. But even more intriguing was the use of ocean swells for both direction and finding land. Mau was able to identify up to eight different directional swells in the open sea, and maintain the canoe’s course by the angle of a certain swell to the hull of the canoe. On one voyage where he was not the master navigator, Mau woke out of a dead sleep and told the steersman that the canoe was off course, just by the feel of the swells hitting the hulls of the canoe. Since reflection and refraction of the swells off islands alters their patterns, a sensitive navigator can detect land below the horizon. Certain species of land-based birds indicate proximity to land, and for a trained navigator, the flight patterns of birds can indicate in which direction that land lies. A very careful reading of clouds on the horizon can also reveal the presence of land. Most importantly, the navigator keeps track of position by a form of dead reckoning—keeping a mental record of distance travelled, speed, drift and currents. For this reason it is said that one can identify the navigator on the canoe as the one with the bloodshot eyes, for the navigator sleeps rarely or never. Today the Hōkūleʻa uses a star compass developed by Nainoa Thompson, who as a young crewmember on the first voyage became fascinated with traditional navigation, and set about to figure it out for himself. His own voyage of rediscovery is beautifully documented in Sam Low’s book Hawaiki Rising and also in Will Kyselka’s An Ocean in Mind. In more than 40 years of voyaging, the Hōkūleʻa has “rediscovered” all the island groups of the Pacific. What was left to do? Circumnavigate the globe. Not to prove anything this time, but to show that traditional knowledge teaches us how to live right on this planet.